“So projects that constitute normalization are not about freedom, justice or liberation, but about numbing our minds to the horror of the occupation, so we accept it as normal, as permanent, as an unchangeable fixed reality”! 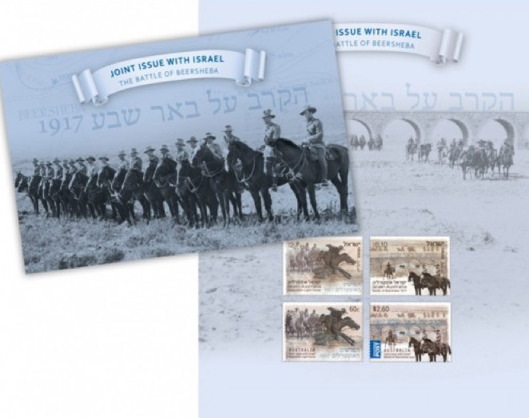 ANZAC heroic courage and endurance warrants commemoration but the issue of the stamps entailed a cynical rewriting of Australian war history that deflects ANZAC honour to deodorise Israel’s stinking reputation around the world; the recent BBC’s 2013 Country Rating Poll places Israel squarely amongst North Korea and Pakistan as the world’s most negatively viewed nations. “Defending the west and south west of the town, the 27th Division’s 67th and 81st Infantry Regiments, were deployed in the fortified semicircular line of deep trenches and redoubts strengthened by barbed wire. These regiments consisted mainly, of “Arab farmers from the surrounding region, and although inexperienced fighters they were defending their own fields.”(Massey, Graeme (2007). Beersheba: The men of the 4th Light Horse Regiment who charged on the 31st October 1917. Warracknabeal, Victoria: Warracknabeal Secondary College History Department. …while Palestinian villagers struggled to survive the dire economic impact on their land and livelihoods of the mounted armies of the Imperial and Ottoman forces. The Turks had demolished orchards and all the cavalries ‘drank out wells and grazed their horses on standing crops’. Palestinian foodstuffs and livestock were requisitioned by the British military and consequently there was a shortage of basic food and commodities with awful disruptions to daily life.